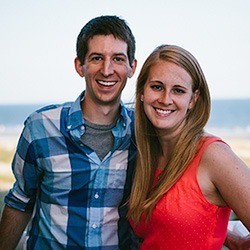 Travis and Michael, the two con artists who operate Auto Binary Profits, have created a pretty slick website that showcases a lot of pretty graphics and parallax design. When you click on the Get Started Today call-to-action button , you watch an introductory video that “blasts” all the other work-at-home scams out of the water. 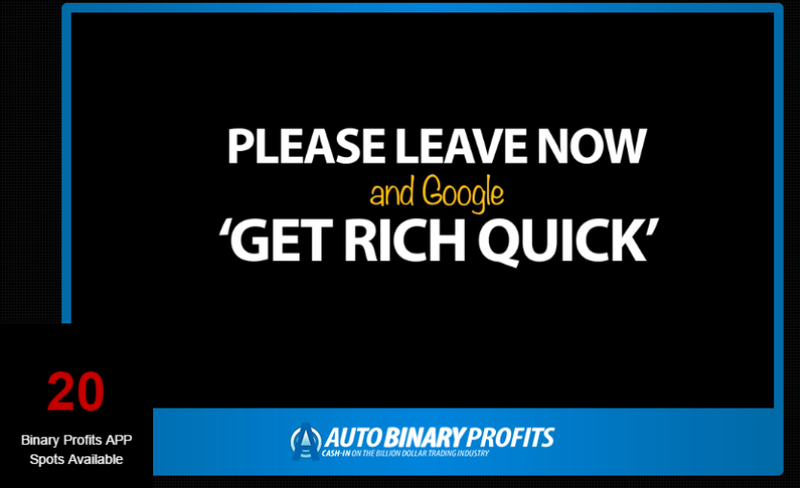 Travis boldly says that, if you are looking for a way to get rich quick setup through Auto Binary Profits, you had better leave now. Smooth. Keep watching this video and Travis eventually introduces you to his partner-in-crime Michael. 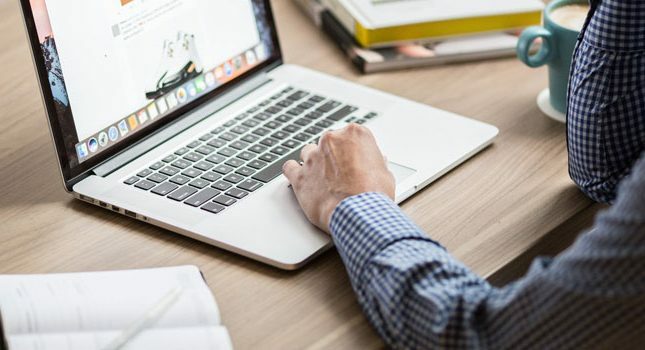 Apparently, Michael is “teaching” a virtual classroom full of eager students, who will now go from being absolute binary options newbies to money-making pros. And because the video is showing you several live streaming video clips, it can’t possibly be a scam. Perhaps what Travis and Michael don’t realize is that any video converter tool will enable you to merge several videos into one file in order to show them simultaneously. What bugs me about paying even $10 for this “software” is that most binary options scammers provide you with their sham product for free. The scamming begins later, after you’ve downloaded the bogus software and progressed to the trading platform. 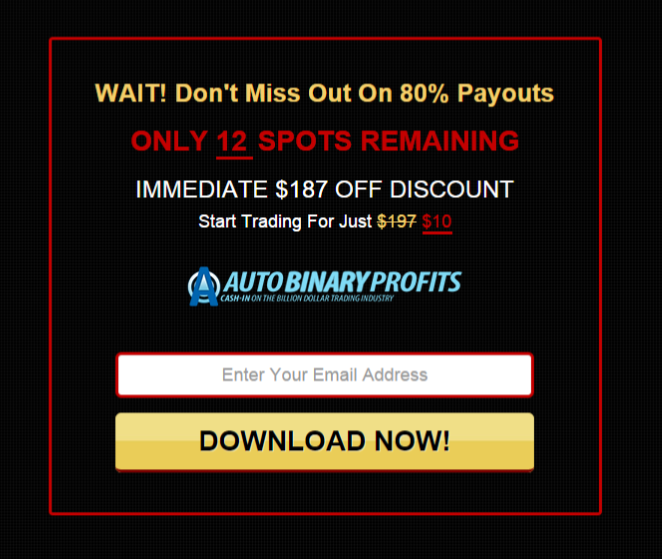 Aside from getting the software, what does $10 buy you at Auto Binary Profits? Apparently, you gain access to a special forum, where you and other “students” can perfect your trading techniques so that you earn more and more money each month. Travis also chastises the students who are lazy and want to make $50,000 right at the start of the program. He emphasizes how making $50,000/month takes hard work and dedication, and how those looking to make a quick buck will fail. Incidentally, if you don’t know what Clicksure is, it’s an affiliate product marketplace akin to Clickbank, but which carries products that Clickbank would never touch. In other words, most (though not all) Clicksure products are scammy and/or spammy and only seek to separate buyers from their money. Your best bet is to steer clear of Clicksure and its products. Overall, this is not the highest paying binary options scheme I’ve seen, with a payout of only $50 promised for every trader scammed- I mean recruited- into the system. What’s really ironic about locating this affiliate program is that, all through the recruitment video with Michael, Travis goes on and on about how he has enough money and is giving away his software for free. His only request is that would-be students of Auto Binary Profits “pay it forward” and use their new-found wealth to help out the homeless, or those who are less fortunate. 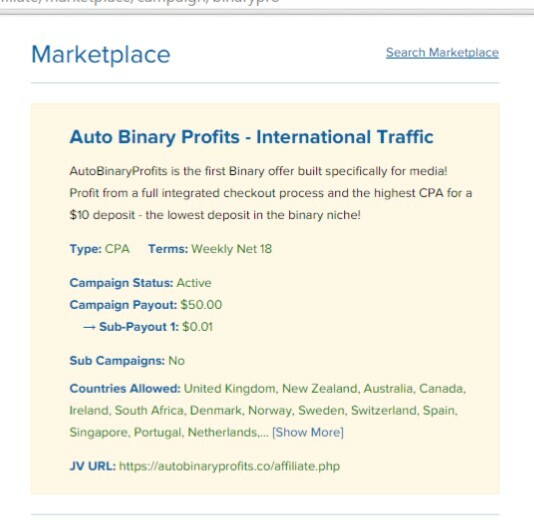 Let’s say you make it down to the Auto Binary Profits checkout page just to see how much you need to pay for this system. At the checkout page, the site suddenly ups your total cost to $20 again. But wait! If you buy in right now, you’ll have that $20 “investment” credited to your trading account. That’s how Auto Binary Profits gets away with saying it’s absolutely free. 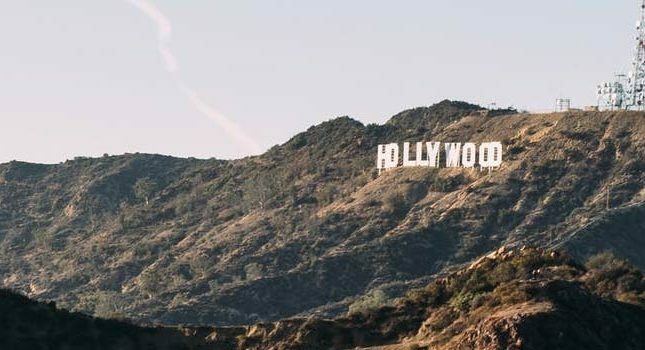 In summary, if you’re looking for a tried-and-tested online program that actually teaches you a way to make money, give Wealthy Affiliate a chance. I’ve been there in the past, and its wealth of knowledge and member experience is truly amazing. Even better, you can try the Wealthy Affiliate program for free– then leave if it doesn’t appeal to you.